As we enter the 5th year of working with Greggs and as their position in the student market goes from strength to strength, it seemed like the perfect time to reflect on our epic journey with this renowned brand. 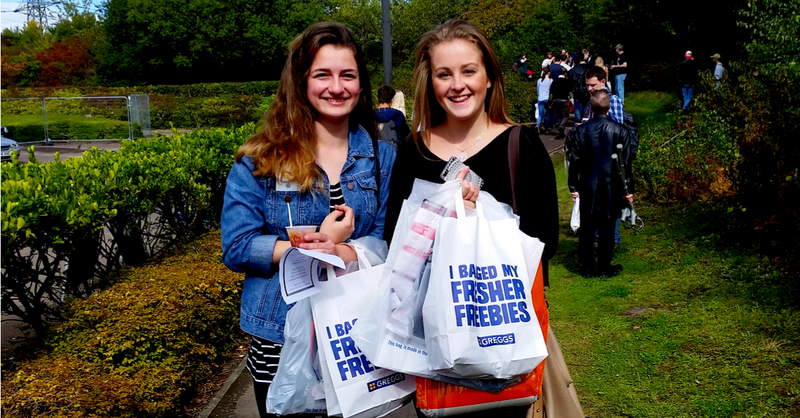 Way back in 2014 Greggs approached BAM to facilitate a trial campaign at 9 Freshers events across the UK. The response to Greggs and the results from the trial were fantastic which meant that we began working with Greggs to plan a nationwide Freshers campaign for 2015. We took the leap from 9 to 46 Freshers’ Fairs across the UK, stretching from Dundee to Southampton. 2015 saw the phenomenon of the “Fill Me For Free” bags which were an absolute hit with students. On receipt of one of these desirable bags, students could take the bag to their local Greggs store and fill the bag with a choice of Freshly baked products for free. Fair after fair saw Greggs have a constant queue of students vying to get their hands on one of these bags. 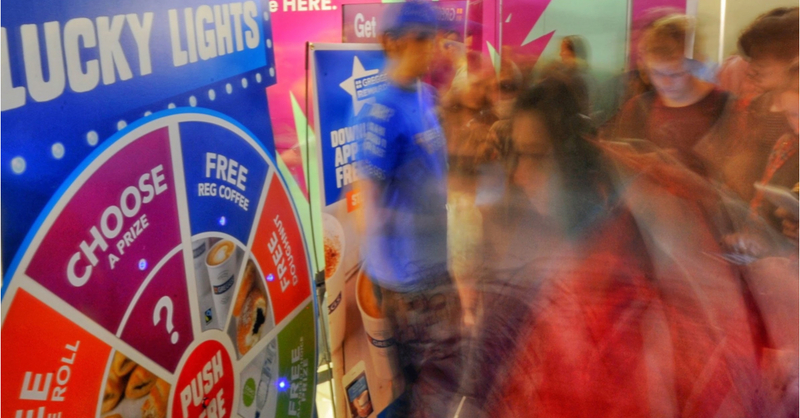 Not content with simply distributing the “Fill Me For Free” bags, Greggs gave students the chance to take part in an interactive game of “spin to win” or “lucky lights” for the chance to win some awesome prizes including free food vouchers, thermos mugs, USBs and pens. 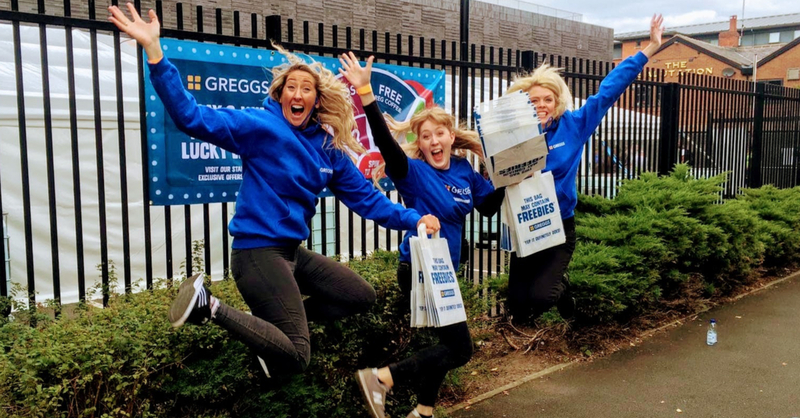 Through the huge presence on campus and the connection made during the 100 days at University, alongside the engagement through the gamification activation and through the highly coveted freebies, Greggs positioned themselves as a student favourite brand. Over the last 2 years BAM have conducted our own independent Freshers survey to find out just what students think of the fairs and the brands that attend. In 2016 Greggs just missed out on a place in the top 10 brands at the fairs as voted for by students. However we saw the hard work and commitment to the student market pay off as they rose to 2nd place in the top 10 brands of 2017. With competition from big name students brands like Wagamamas, ASOS, Lucozade and Nando’s, Greggs claiming a top spot in 2nd place is testament to their understanding of the student market and formulating a highly effective campaign. The success didn’t end there, Greggs were also rated as the favourite food brand in the Youth 100 at the YMS 2017, another amazing achievement. As our relationship with Greggs continues to grow, we are exploring the opportunity of switching the campaign up from a Freshers only presence to an “always on approach”, with year round presence in 2018. Watch this space.